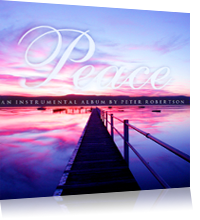 This cd is a highly recommended instrumental by Peter Robertson - an anointed musician from Australia who does all of the guitar work for The Secret Place albums. Create a peaceful, restful atmosphere in your home, work or car. Sit back and relax and let the music take away all the stress life can bring. This easy listening music features gentle acoustic guitar and piano, with laid-back melodies and the ocassional soft sax. Let the music quieten you as you rest in a peaceful ambience. Create a relaxing atmosphere with these soft easy listening instrumental cds. The beautiful combination of acoustic guitar and piano will bring peace and rest to your environment. "The whole world is searching for peace. Find God's peace in this music that calms the weary soul."